Home > Autogeek Racing - Bruno Massel > Autogeek Detailer’s Bag NEW & IMPROVED! Part tool box, part organizer, all Autogeek! Heavy-duty, curved metal handle that allows taller bottles to fit more easily. This also helps when your Autogeek Detailer's Bag is full to the brim, but still has to be carried - there's still room for your fingers! New color scheme - primarily black with red trim. Overall improved appearance and feel. The Autogeek Detailer’s Bag is a carry-all for your detailing supplies, even your polisher! 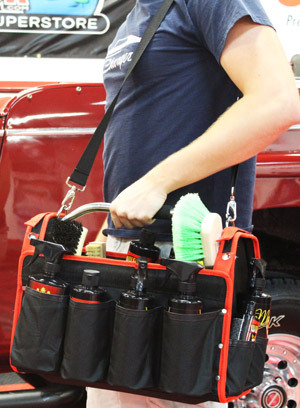 Just like a carpenter’s tool box, the Autogeek Detailer’s Bag carries your tools of the trade. This well-made, generously sized organizer holds bottles, buffing pads, brushes, and everything else you need to tackle any detailing job. Look at all the car care products you can carry in your Autogeek Detailer's Bag! * Contents of bag not included. 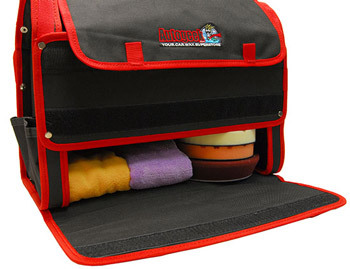 The bottom flap folds down and easily accomodates multiple polishing pads and microfiber towels! This bag reminds us of the old-fashioned doctor’s bag. It’s perfect for a mobile detailer making house calls. With 12 pockets, two large compartments, Velcro™ fasteners, and interior elastic straps for small items, the Autogeek Detailer’s Bag literally has a place for everything. At 17 inches long, the Autogeek Detailer’s Bag accommodates the Porter Cable 7424 XP and most other polishers. It has a bottom compartment for pads and backing plates. You can fit 10 16 oz. bottles, two 8 oz. bottles in two smaller pockets, multiple detailing brushes and swabs, towels, and there are even Velcro™ fasteners on the top of the bag to secure an extra extension cord. Whew! That’s a lot of detailing supplies but the Autogeek Detailer’s Bag can handle it. Speaking of the handle, it has a soft grip and there’s an optional shoulder strap to keep your hands free. Load it up! The rugged construction of the Autogeek Detailer’s Bag means you can fill it full of products without putting any strain on the materials. The stainless steel handle is secured into the hard end panels that give the bag its shape and strength. The entire bag is made of rugged, water resistant, 600 denier nylon canvas. The seams are all reinforced with black canvas and metal studs. The bottom of the bag features two non-skid feet. 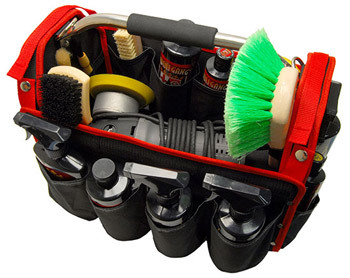 The Autogeek Detailer’s Bag is a must-have for any detailer or hobbyist. The bag is big, its functional, its organized, and it looks great. The black bag has red trim with the Autogeek logo embroidered on the top flap. Carry by hand with the reinforced, heavy-duty metal handle, or sling the Autogeek Detailer's Bag over your shoulder and be on your way! 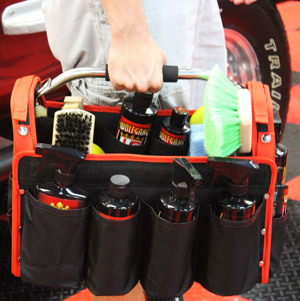 Polishes, towels, a buffer, and pads are the tools of your trade and the Autogeek Detailer’s Bag is your tool box. These bags are pretty good. You can fit quite a bit in one, which makes life easier - especially if you are a mobile detailer. Not perfect, but the issues are pretty minor. Poor quality control. 2 snaps weren't crimped properly. It'll will be easier to buy a snap kit and repair it myself than to send it back. Cons2 of the snaps were improperly crimped. One fell off and the other was smashed. I really like this carry it all bag from Autogeek. It could be a bit larger though but it does work well for my needs and it fits nicely in my Mini's hatchback which is a plus for me. All the materials are of good quality and the structure is strong. The red and black color was appealing to me also. Highly recommend this bag. I'm using this bag to store the supplies needed to do reverse osmosis filter changes. This bag has all the pockets and compartments to fit in everything I may need to do a service call. Its sturdy, well made and easy to carry. Bought this bag for my cordless flex polisher and it worked out great. Charger and battery's fit perfectly in the bottom compartment, polisher was a little tight up top but it fit. Hardware to install handle wasn't great and the holes where a little off. I would definitely buy another bag.